I want to draw your attention to the current state of our nation's indigenous forests. Our national trees, the giant “yellowwoods” of South Africa, are all but gone. You can still see yellowwoods along the highway in the Tsitsikamma forests and even stop to see the "Tsitsikamma Big Tree", but these trees are just remnants of the impressive old-growth forest patches that once existed along our coastline and in our mountains. In just two generations we have forgotten what these forests even looked like and accepted how they appear today. The one thing that most developed countries will not have in 50 years time is wilderness and intact indigenous habitat. A socio-economic truth in Africa is that we have the most untapped natural and human resources on Earth. Now is the time to guard this competitive edge carefully and make sure that we use our natural resources sustainably, while preserve our beautiful natural heritage. This is Africa’s century and we need to make sure that we have something to show for it in one hundred years time. Our forests, grasslands, wetlands, beaches and bushveld are the next generation of South African’s most important asset. In 1994, the new ANC government inherited a policy of sustainable timber harvesting in indigenous forests from a government focused on self-sufficiency during the Apartheid years. The Department of Agriculture, Forestry and Fisheries (DAFF) has never had the specific mandate to restore our national forests. Indigenous forest management on government land has been underfunded after the privatization of most commercially viable plantations and forests. The truth is we are not doing enough to protect and restore our national forests and hundreds of villages, towns and cities depend on goods and services from these threatened forests. I would like to propose that it officially becomes the responsibility of every South African to rebuild our national forests, while government (DAFF) oversees, facilitates, licenses, co-funds and supports non-profit NGOs and local cooperatives that plant indigenous trees with local communities and develop new green enterprises. Department of Environmental Affairs (DEA) programs like Working for Water and Working for Fire would benefit hugely from independently-funded non-profit NGOs and community-run cooperatives planting millions of indigenous trees in areas where invasive trees like Australian wattle are currently being removed. We need to repurpose the role played by both DAFF and DEA in indigenous forest management to atone for the catastrophic damage done to our national forests by previous regimes and colonial powers. Healthy indigenous forests are a direct reflection of the moral and social development of a country. In 1652, Jan Van Riebeeck described the forests of t’Houtbaaijten (Hout Bay, Cape Town) as "the best in the world" and then proceeded to cut down all the yellowwoods in this secluded bay to build fortifications. This forest is still gone. Many other forests disappeared in the centuries to follow as more settlers and migrants arrived to build colonies using indigenous timber felled by European “wood-cutters”, government foresters and Xhosa pit-sawyers. 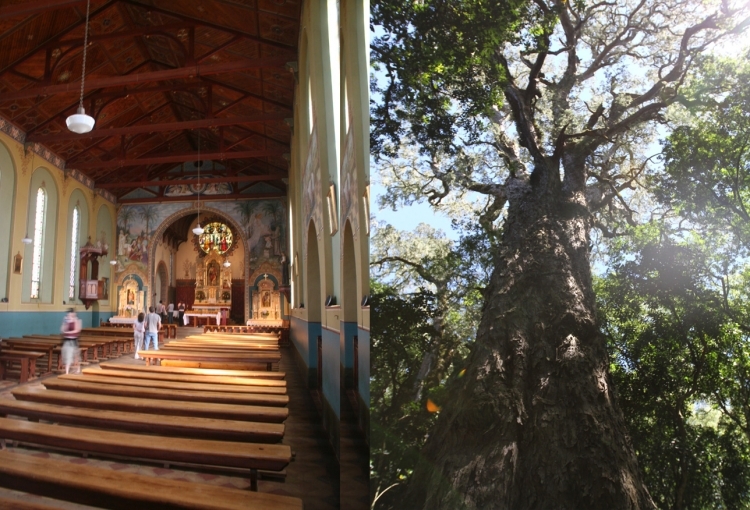 Just 350 years ago there were hundreds of thousands more large, tall yellowwood trees dominating the high canopy of an archipelago of Afromontane and southern Afrotemperate yellowwood forest patches along the south coast of South Africa from George to Humansdorp, up through the Eastern Cape, Transkei, and southern Drakensberg, and all the way north to Magoesbaskloof in the Limpopo Province. According to local Xhosa people living along the Amathole Mountains, yellowwood trees have been widely exploited for over one hundred years and the older people have seen the forests decline and disappear in their lifetimes. For many years the Tribal Authorities in the old Ciskei had forest guards under a mandate to sell yellowwood trees to timber companies. Corrupt officials horded all earnings and did not share with local villages. Older people remember the yellowwood trees, the Umkhoba and Umcheya, as the “government trees” that were guarded jealously from local communities by forest guards. They call the forest guards the “forest police” that only looked out for the yellowwoods. In 1994, these local communities started cutting down and selling large yellowwood trees as a symbol of freedom after the repressive Tribal Authorities had been abandoned as part of our new democracy. DAFF got this quickly under control, but today the local communities still complain about rampant illegal logging by “people from other parts of the Eastern Cape”. We need to break down this culture of exploitation and the association of yellowwood trees with “gold and money”. I am sure you, Mr President, will agree that our natural heritage is worth far more. There is a shocking example in the harvesting records compiled by DAFF in King William’s Town for the period April 1994 to March 1995. These records account for 81 real yellowwood (Umcheya) and 32 Outeniqua yellowwood (Umkhoba) trees that were harvested from indigenous forest in the Amathole Mountains that year. The DAFF report entitled: “Amathole Forest Yellowwood Harvesting Levels” states that “a number of trees had to be excluded from the analysis due to missing data or discrepancies with the data.” It is notoriously difficult to get raw data on the number and size of yellowwood trees being felled each year. The fishing industry needs constant regulation and management to avoid permanent damage to our fisheries. Why not our forests? We need to overhaul government forestry in South Africa, end the harvesting of our national tree, and invest in the restoration of these important forests. This will be our legacy to future generations. The core vision of the “Amathole Forest Yellowwood Harvesting Levels” technical report reads: “Forests are managed for people and we need to create an enabling environment for economic and social development through sustainable forestry, especially at the local level”. We, the Wild Bird Trust, are fully supportive of this vision and work with local communities to grow and plant trees in our indigenous forests everyday. This vision is, however, made impossible by the ongoing harvesting of yellowwood trees and events like the felling of over 100 large yellowwoods in one year. Most local people do not benefit from yellowwood timber sales, while the ability of their indigenous forest patches to produce food, poles, building materials, clean water, fuel wood, thatching grass, and medicinal plants has almost irreparably been diminished. If, one day for example, local people want to legally hunt in these forests again, we would need to let our remaining intact forest patches recover for at least two generation. Our national forests need at least 25 years of intensive re-planting and restoration followed by 25 more years of recovery before we can say they are on their way to recovery. By then the 3-5 million indigenous trees will be tall and big. Just imagine large areas of indigenous forest with harvestable timber and no threat of being exploited or destroyed. For centuries the best furniture, homes, boats and luxury goods were made from shining yellowwood timber. Named for the beauty of its wood, yellowwood adorns our parliament, estate homes, courts, embassies, and old bank buildings. Umkhoba and Umcheya are our national trees. By the late 1800s the demand for yellowwood had worked its way up the coastline past Knysna and Tsitsikamma into the Amathole Mountains and KwaZulu-Natal. Most of this yellowwood timber was used to produce the millions of railway sleepers and mining timbers necessary to sustain an explosive boom in the mining industry. By 1900, we had already decimated most of our yellowwood forests through excessive and wasteful cutting, burning and clearing geared at keeping up with demand. For almost one hundred years we were, in essence, trading gold from the ground beneath us for "gold" from our forests, bringing one up and sending the other down. All yellowwood trees are now protected. Permits are, however, still active that allow sawmills to harvest yellowwood trees up to their quota every year. Most of trees felled are over 200 years old and irreplaceable. The equivalent of 600 cubic meters of yellowwood timber or anywhere between 20 and 100 large yellowwood trees are felled legally each year in the Amathole region alone. The fact is that, if we continue, legal and illegal logging will very soon destroy our national forests. We have seen more yellowwood tree poaching in the last three years than in previous years and record the loss of important yellowwood trees every year. Some desperate local communities in the Transkei region are burning yellowwood as firewood. Now is the time to protect our golden indigenous forests. Right now there are harvesting contractors targeting the last-remaining intact yellowwood forest patches, eroding our natural heritage every day that yellowwood extraction continues. Today, only a handful of yellowwood trees over 500-years-old remain scattered in remote, degraded forest patches protected from historical and illegal logging by inaccessibility, proud landowners and local foresters. In King William's Town and Keiskammahoek (Eastern Cape) you can see 200, even 300-year-old yellowwood trees being chopped up at saw mills. Yellowwood planks are now valued at up to R25,000 ($3,000) per cubic meter, an increase in value of over 400% in the last 6 years. This sets a high price for our natural heritage, as legal yellowwood timber is getting harder to source and prices are being driven even higher. What is incomprehensible about all this is that much of this trade is being done legally. The technical report on the "Yellowwood Harvesting Quotas for the Eastern Cape" allows a quota of 600 cubic meters of yellowwood timber from dead or dying yellowwood trees in the Amathole Mountains each year. Unbelievably every year 50 or more large yellowwood trees are marked for extraction by government foresters. From the perspective of the harvesting contractors with 70-year permits to cut yellowwood trees, the yellowwood harvesting quotas are almost impossible to use, as trees suitable for harvesting are very rare (i.e. dead trees or trees with at leas 75% of the canopy dead). Some people have turned to ring-barking or even poisoning yellowwood trees. For example, we have found evidence yellowwood trees poisoned with diesel to kill them for harvesting the next year. The new government-endorsed yellowwood harvesting protocols actually support the targeting of healthier yellowwood trees than before due to contractors complaining about poor timber quality. The technical report also applies forest biometry theory incorrectly and inappropriate sample plots in unsuitable locations were chosen to justify ongoing harvesting of both yellowwood tree species. These and other inadequacies found in the technical report highlight the need for better training, record-keeping, and auditing of annual yellowwood harvesting quotas. We need external auditors to make sure that healthy yellowwood trees are not being marked and felled. If you care about our natural heritage, you must institute a zero tolerance, zero harvesting quota as soon as possible. None of the sawmills or harvesting contractors will go bankrupt or lose their jobs, as these businesses depend on blackwood timber to be profitable. Blackwood is an invasive species from Australia with wonderful fine, red wood that is sought after by furniture manufacturers that pay up to R15,000 per cubic meter. Removing blackwood from the Amathole Mountains and other catchments around South Africa helps our indigenous forests, removing large yellowwoods irreversibly harms them. Legal and illegal harvesting of yellowwoods happens even though these trees are nationally protected. There are now only seven yellowwood trees on the "Declared List of Champion Trees" published by DAFF last year. Names like "Eastern Monarch", “King Edward VIIth Tree” and "Woodville Big Tree" speak to the grandeur of these sentinels that have stood over our forests for up to 2,000 years. We, the Wild Bird Trust, would like to propose the protection and recognition of thousands more culturally, historically and ecologically important trees by establishing the "South African Heritage Tree List". This list will include all protected indigenous trees over 100-years-old throughout South Africa. We protect buildings over 100-years-old. Why do we not do this for trees? We must establish a task team to locate, sample (for DNA finger-printing) and mark all "Heritage Trees" with a presidential seal to protect them from harvesting in the future. “Heritage Trees” will become presidential or “government trees” again, but, this time, for the right reasons. The Wild Bird Trust volunteers to establish a website for the location and photo of all “Heritage Trees”, so that every South Africans can find these magnificent trees in their area and even report back on their condition or send in a photos. The "South African Heritage Tree List" will have thousands of trees on the register all of which will need to be clearly marked with a presidential seal to avoid being cut down or damaged. We must start being proud of the amazing trees we still have and stop cutting them down. Future generations will thank us and foreign visitors will be impressed. After our “Heritage Trees” have been clearly marked and protected, senior scientists at DAFF must supervise the development of new sustainable harvesting quotas for indigenous trees under 100-years-old. Vital government-subsidized, community-based tree-planting programs, like the Wild Bird Trust’s "iziKhwenene" Project, the Wildlands Conservation Trust’s Treepeneurs Project, and the work done by Food & Trees for Africa over the last few decades, must be established throughout South Africa in and near all forests and bushveld areas. We must make "indigenous forestry" a viable economic driver for remote rural communities. This could be done through carbon trading, extracting tannins from wattle bark, and even well-funded, long-term tree-planting programs managed by non-profit NGOs. Government, public benefit organisations and local community-run enterprises are going to be the key to rebuilding our national forests. The restoration of our yellowwood forests in South Africa presents us with a development model that supports natural resource management and enterprise development in poorer provinces like the Eastern Cape, KwaZulu-Natal and Limpopo. Carbon trading is a huge opportunity, as all yellowwood trees planted cannot ever be felled. With government backing all proudly South African businesses and corporates will support the planting of millions of yellowwoods with disadvantaged rural communities that need jobs. We will build hundreds of small “micro-nurseries” and benefit thousands of people during the restoration of our national forests. We ask you, as concerned citizens, to recognize officially that our natural heritage is more important than natural resource use, announcing that saving our remaining yellowwood forests as a national priority. These trees knew our ancestors and connect us to the greatest events in our history. A small handful of people have made a lot of money from logging and sawmilling yellowwood trees at a catastrophic cost to the remaining forests. It is safe to say that we now sit with less than 10% of the yellowwood trees we had 350 years ago. Every year we chip away at the remaining trees as the forests slowly shrink. The trees are getting smaller, the forests are getting thinner, and the canopies are getting lower, as exotic trees invade our open spaces and water catchments. I would appreciate the opportunity to meet with you to discuss the future of our indigenous forests and our national tree. We are proud of our rich natural heritage here in South Africa and cannot let another yellowwood tree be felled. I am a loyal citizen and servant of the Republic of South Africa and will gladly give of my time to solve this problem. I live in Hogsback Village in the Amathole Mountains, own land there, will raise a family there, and am dedicated to restoring the indigenous forests of our great country. I have wonderful friends at DAFF in King William’s Town and look forward to working more closely with them in the future. Dear Msholozi, Dr Zuma, we need your support, as the head of state, and champion of the people. Old people in the villages near the Amathole Mountains have seen their ancestral forests destroyed and replaced with pine and Australian wattle. We, the undersigned, herewith officially ask you to intervene by ending all further logging of our national tree, the yellowwoods of South Africa. We do not hunt our national bird, the Blue Crane. We do not unnecessarily cut down our national flower, the protea. In fact, we work very hard to protect them. The yellowwood trees that we lose tomorrow, the next day, and the week after that cannot be replaced… We humbly request the establishment of a "South African Heritage Tree List" and marking all indigenous trees over 150 years old as protected on the registry. Yellowwood trees of up to 2,000 years old are valuable assets, as well as items of natural heritage. We ask you, as concerned citizens, to recognize officially that our natural heritage is more important than natural resource use, announcing that saving our remaining yellowwood forests as a national priority. These trees knew our ancestors and connect us to the greatest events in our history. A small handful of people have made a lot of money from logging and sawmilling yellowwood trees at a catastrophic cost to the remaining forests. It is safe to say that we now sit with less than 10% of the yellowwood trees we had 350 years ago. Every year we chip away at the remaining trees as the forests slowly shrink. The trees are getting smaller, the forests are getting thinner, and the canopies are getting lower, as exotic trees invade our open spaces and water catchments. The Halt yellowwood harvesting & restore national forests petition to President of South Africa was written by The Wild Bird Trust and is in the category Environment at GoPetition.